Clearly iStamp: From FRUMPY to FABULOUS! Lori here with a tutorial that is sure to make your desk just a little cheerier! I don't know if any of you have priced colored hanging folders lately, but it is RIDICULOUS how much they want for a pretty hanging folder! Staples wants $21.49 for 25 hanging folders....and then they aren't very pretty! So I decided to dig in to my ENDLESS supply of cardstock and make some pretty ones myself! Let's get started making our desk cheery now! 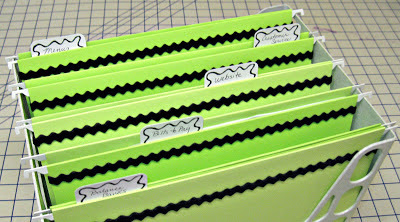 First, I removed the metal hanging rod from my frumpy green hanging folders....which I have a TON of. Next, we are going to prepare our 12x12 cardstock to create our folders. Cut your cardstock to 11 1/2 x 12 inches. Score at 9 and 10.5- 10 3/4 inches for the front side of your hanging folder. Score at 9 inches only for the back side of your hanging folder. Next, use some double sided tape that is 1/4 inch wide and place it about 1/8 inches below the 9 inch score line. You are going to use this strip of tape to adhere your metal hanging strip from your old folder. Next place a second piece of two sided tape (I am using Scor Tape) below your metal hanging strip. Fold over at the 9 inch score line and adhere. This is what it is going to look like for the inside of the front side of your hanging folder. I have begun to fold up my cardstock at the 10 1/2 inch score line to create my pockets for my labeling tabs. I am going to create pockets for my labeling tabs as shown below. Place two sided tape at 1/4, 3, 5 3/4, 8 1/2, and 11 1/4. Fold this over and adhere....this creates your tab pockets! For the back side of your hanging folder you are going to adhere the metal hanging strip just like the front side and fold over and adhere. You will just omit the steps that create the tab pockets....unless you want tab pockets on the front an back of your hanging folder! Now, we are going to tape the front and back together to create our folder. I started by laying them bottom to bottom with the wrong side up. I then put a strip of tape the length of the folder. Next, turn them over so the outside of the hanging folder is up. Put another strip of tape across your seam, but this time make it longer than the folder and wrap it around the ends to the inside for extra strength. I was trying to decide what to use for the tabs and remembered that Austin had made this adorable set of borders which could NOT have worked ANY better for this project!!!!! Go To Borders Digital Image here! So I chose this set of borders (because they match the coordinating duck tape drawers I made for my desk) to make my tabs! When I pasted them in to my document to print them, I made the image 2 inches wide and let the length default to whatever size to make it stay proportional. I am going to make a bunch of these little tabs up so as my folders change I can make a new tab! Amazing how a pretty little desk organizer can change your attitude about getting work done! Here is my desk so far. I am working on getting it all organized! The drawers that fit in the cubbies are all make out of recycled cereal boxes and Cliff Bar boxes! Can you see all the possibilities for these hanging folders? What a cute moving present, birthday present, or anytime present to give to a friend out of their favorite colored cardstock! The possibilites are endless! 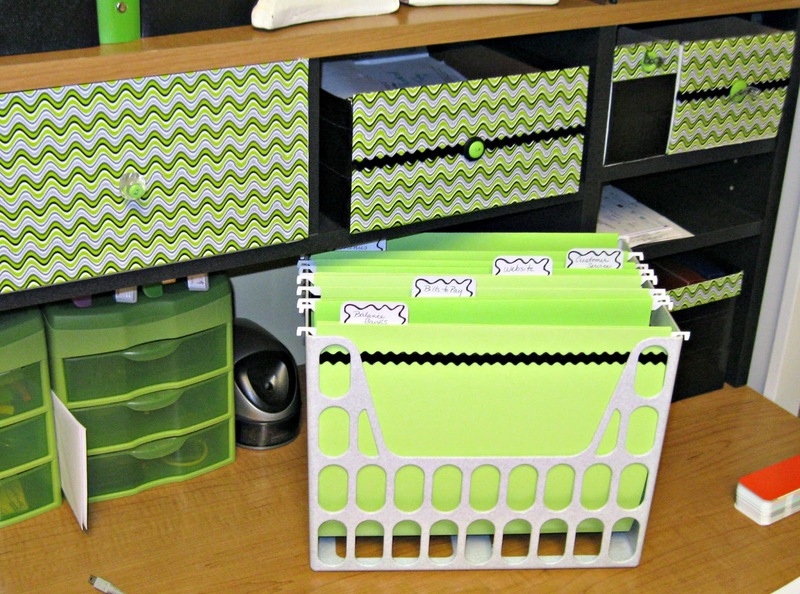 You can find the desk top hanging file holders just about anywhere. Staples, target, and organizational stores will all have them. This one I remembered was sitting in my storage room from about 10 years ago! I got it out, dusted it off, and ta-da! Hope you enjoyed this tutorial! If you decide to make some for your desk, leave a link in the comments...I would love to come and see what you have created! Hope your day is filled with blessings and creativity galore! Fabulous idea and love the tutorial! Eeeek! I love that you used my borders!! What a creative project!